Okay, I know pumpkin spiced products are already available, but it's not fall just yet. 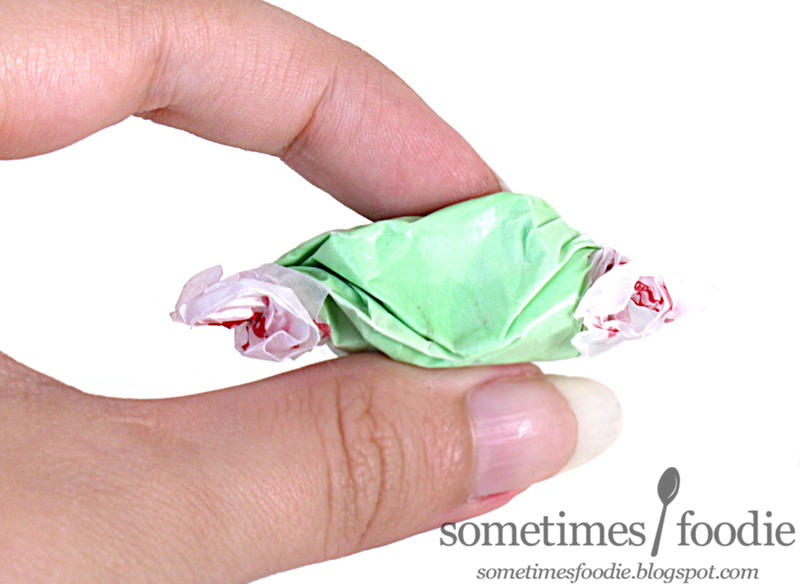 Summer doesn't end until the first official day of fall, which isn't until September 23rd, so let's pretend it's not September for a moment and eat some more sticky salt water taffy. I've got six more wacky flavors left to try. Unwrapped, this stuff smells just like muffin mix from a little Jiffy box. It's crazy! I can smell blueberries, like actual blueberries, butter, and something that's reminiscent of baking soda or powder. How is this possible?! 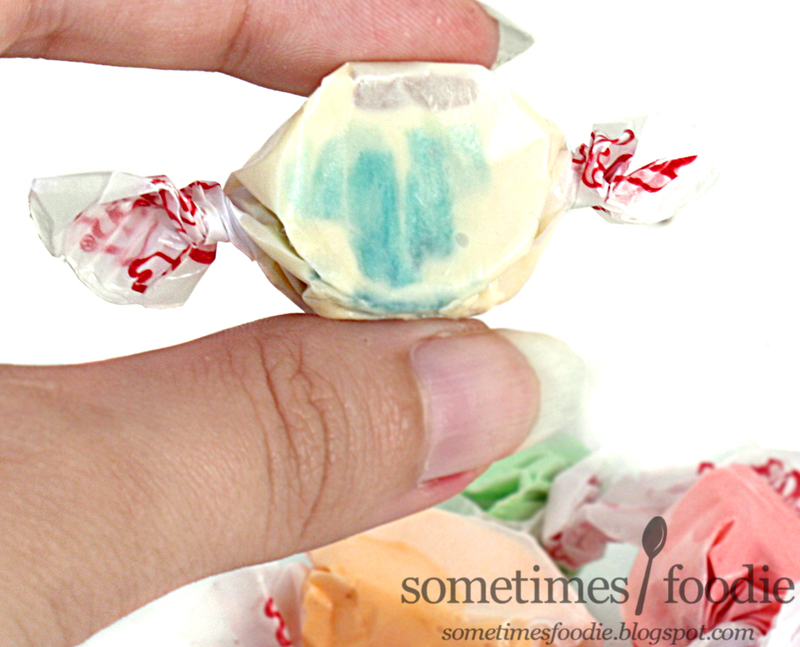 (Someone at Taffy Town is secretly Bertie Botts.) 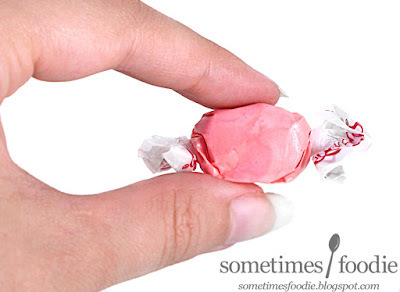 I popped the taffy into my mouth, and this was just incredible. It's like buttered popcorn with blueberry compote. Sweet, buttery, a little salty, and fruity. It's just...how do they do that? Blueberry muffin is the Taffy flavor I never knew I wanted until now. This is crazy accurate, and I would definitely buy more of this just so I could watch every else's expressions when the flavor kicked in. This time it's a flavor I've actually had before, Red Licorice! Red licorice was in that assortment from Trader Joe's I reviewed a little while ago, so I've had this flavor before, and I'm hoping this Taffy Town version tastes better. Unwrapped, it has that same waxy fruity aroma that's reminiscent of Twizzlers or cheap dollar-store lip balm as the Trader Joe's variety, but when I took a bite, I found that this was a lot more mild in flavor. It's sweet, a little chapstick-y and plastic-y, and disappointing to be honest. Of all the wacky flavors I tried, this was the least interesting and it's the only one I won't be repurchasing. 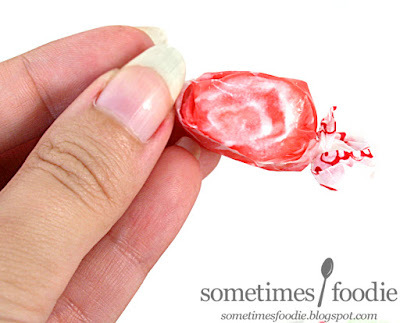 Maybe I got a bad piece, but it was really mildly flavored and I kind of felt like I was chewing on wax, but it had the consistency of normal taffy. Maybe it just seems dull when it's being compared to so many other well executed flavors, but even so, I can't say I recommend it. This one is a brand new flavor that was just released this year, Cantaloupe! I freaking love cantaloupe! I can easily eat an entire melon by myself, so I knew I had to try it in taffy-form. As Americans, we're so in love with watermelon that other melons like honey dew and cantaloupe end up being left by the wayside. 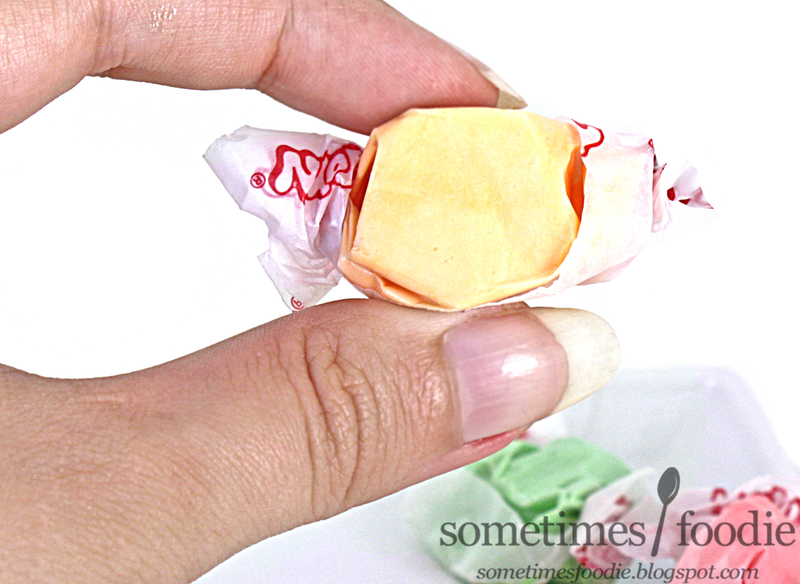 I've never seen a cantaloupe flavored taffy before, and as far as I know, this is the first of it's kind, so I'm really excited. Unwrapped, it's the perfect creamy cantaloupe color, and it smells...like actual sliced melon! This is freaking insane! I popped the taffy into my mouth and it's just... it's perfect. Absolutely perfect. It's creamy, and sweet, and a little tangy (like when you eat too close to the rind). I wish I had grabbed more pieces! I don't know how to describe this, other than it tastes like actual cantaloupe. Really fresh, ripe, and sweet cantaloupe. This is amazing, and I am absolutely in love with it. I guess this year was melon themed, because they also released a new Honey Dew Taffy. Well you can't have a possible melon-mix without Watermelon! This watermelon in a beautiful bubble gum-y pink color and it smells like watermelon Polish water ice. It seemed a lot softer than the other flavors, so when I took a bite, it was really stringy and messy. Initially it has that sweet but slightly artificial chemical watermelon flavoring, but as you chew it gets a little more authentic. It's really similar to watermelon water ice and flavored popsicles. I like this one more than the honey dew, but less than the cantaloupe, but if there was a melon mix with all three flavors, I would still buy the bag. Lastly, we have Cinnamon Bun! This one is a beige-y color with specks of cinnamon and a swirl of brownish tan-colored taffy in the middle. Unwrapped, it smells sweet and cinnamon-heavy, but there's a hint of vanilla and maybe even cream cheese flavoring in there somewhere. It's one of those sweet vanilla aromas with a sour tang to it. I took a bite, and it starts out feeling like I took a bite out of some ready to bake cinnamon bun dough, but as you chew the cinnamon flavoring gets warmer and brighter. It's vanilla-y, buttery, sweet, a little spicy, and very well balanced. I'm really impressed! 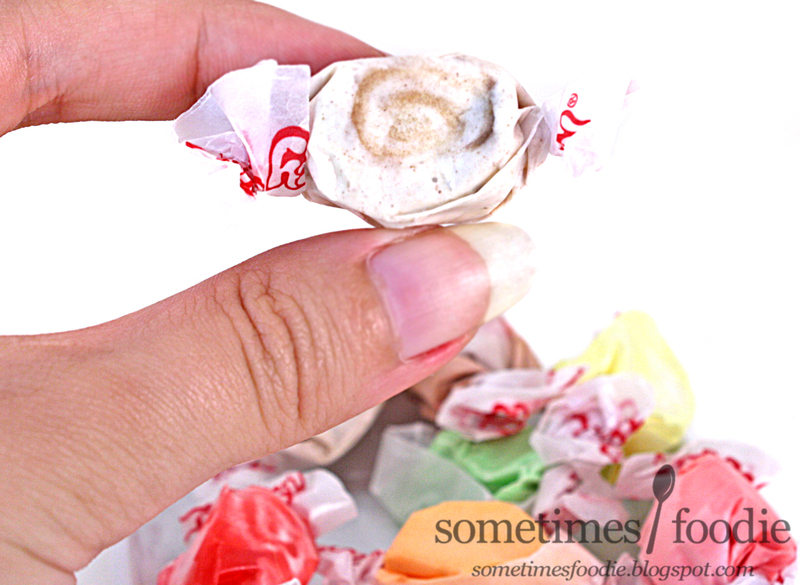 This isn't your run of the mill cinnamon flavored taffy, this is truly cinnamon bun!